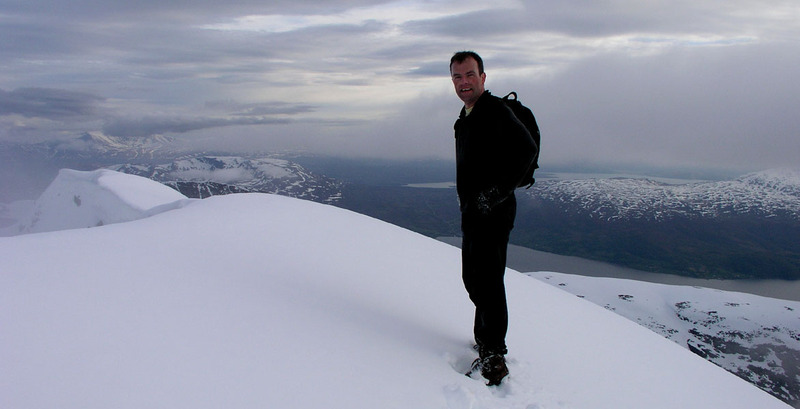 How to get there: From the city of Tromsø, drive south along Hwy. E-8, passing through Fagernes after 24 kilometer. Continue along the fjord, then into Lavangsdalen. Cross the distinct creek that comes down Mellomdalen from your left side, slightly further along, locate a small turnout on the left side of the road at GPS location north 69:27.685, east 019:14.345. Pull over and park here. The elevation is about 65 meter. Route description: Looking across the road, you will immediately see the first part of the route. The mountain is steeper both further right and further left, a broad, somewhat uneven slope that climbs right to left should be visible right in front of you. Cross the road, immediately the first challenge appears, there is a river that must be crossed. This river is about 4 meter wide and flows gently, it is certainly at least one meter deep. Fortunately, there may be fallen trees that can assist a crossing, otherwise you must prepare for a possibly cold beginning of your hike. Head straight up the slope avoiding the first cliffs either left or right. Higher up, climb towards your right side until you can turn left into a broad, but distinct gully that continues uphill and tops out at the (local) horizon. When we did this climb, this gully had contiuous snow from about 500 meter of elevation. Stay on the left side, as there may be a possibility of avalanches coming down the steep slope from Tverrbotnfjellet (1299m) on the right side. Continue up this gully until a distinct saddle at location north 69:27.612, east 019:11.755. The elevation at this point is 813 meter. The sharp ridge of Tverrbotnfjellet heads up to your right, the creek Tverrelva running north-west towards Andersdalen starts at this saddle. Looking across to the left side of the saddle you will see the summit of Stortind. The peak is the leftmost high point with a jagged ridge coming down on its left side. A small glacier higher and opposite of your saddle provides the key to the route. A snowfield above it extends all the way to a saddle that breaks the ridgeline above you. From your 813 meter saddle, contour slighly left and climb to the glacier near some rocks (see the picture below). 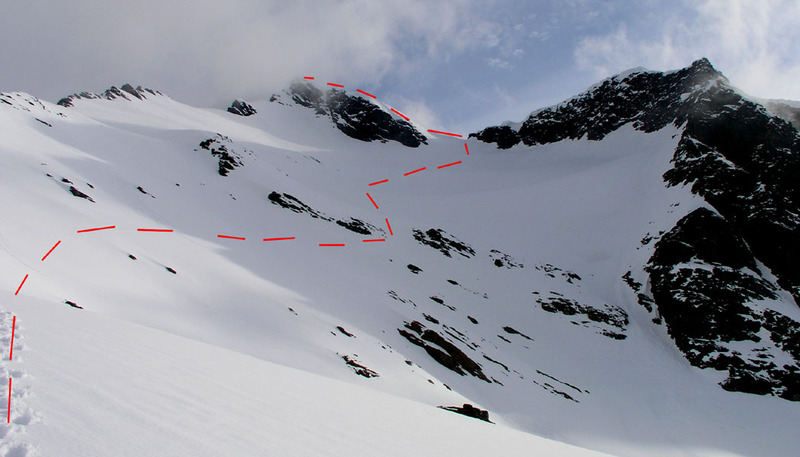 Be aware of possible crevasses, after an initial, somewhat steeper slope, the slope is more gentle and you may head directly for the lowest (right side) point in the saddle above you. There may be a cornice at the very top, when we made this climb, the cornice did not extend across the rightmost part of the saddle, thus providing easy access. Later in the summer, the slope may be hard and icy and crampons and an ice axe should be carried. From this high saddle, one should turn left and climb the final ridge to the summit. 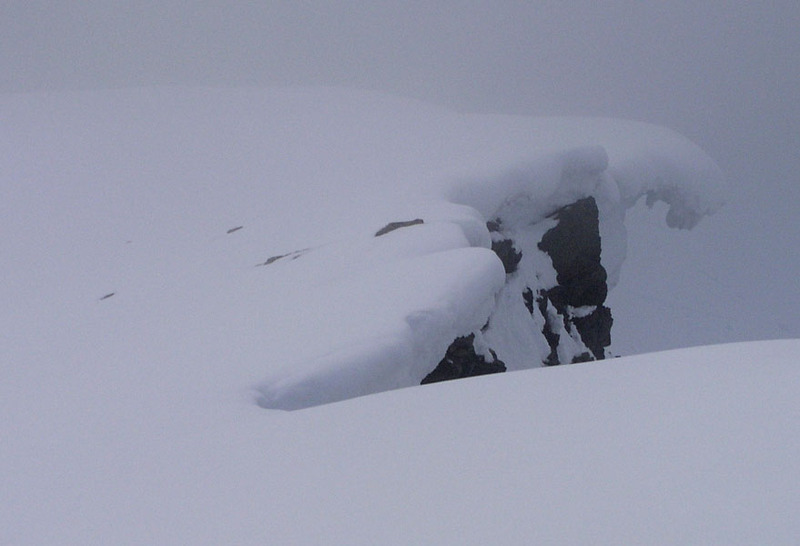 Beware of overhanging cornices, keep a safe distance to the cliffs on your left side. This ridge is broad and one can easily stay well away from any potential danger. The summit itself forms a ridge several meter wide, continue to observe the dangerous cornice that forms over the vertical cliff on your left. Return along the same route. The difficulty of this route never exceeds (YDS) class 2 when following this route, the snow slopes are moderate, however one may need crampons and an ice axe later in the summer. Similarly, climbers should be aware of (and prepared for) possible crevasses in the small glacier below the key saddle. Comments: I did this climb with my friend Jacko Koster. It was an evening hike after the NOTUR conference and Jacko was leaving at 0700 the next morning. We left the car at 1730, made the summit after 3 hours in deep snow, at 2030. The descent took 1.5 hours, so by 2200 we were back at the car heading back to Tromsø. Jacko did a great job breaking the trail all the way up. 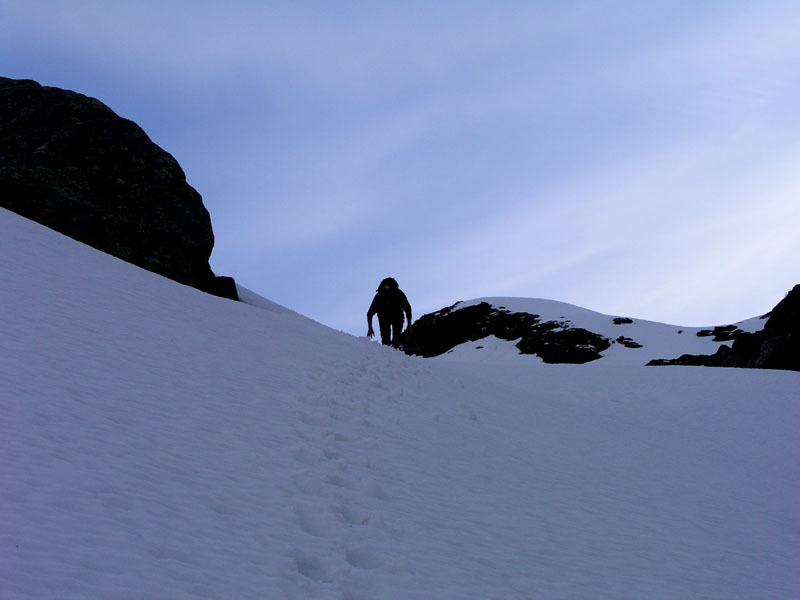 I continued later in the night in order to establish a base camp for an attempt on Hamperokken, 1404 meter, the next morning. 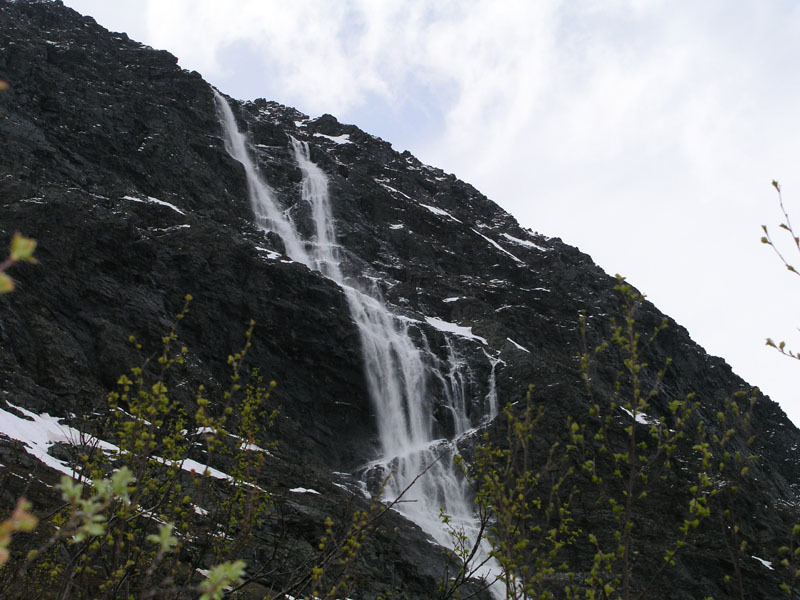 This is not a waterfall, rather the last phase of an avalanche that suddenly came down on our right hand side. An outline of the route from saddle 813 to the summit. Jacko approaching the saddle at 813 meter. Jacko starting out on the second part of the climb. The summit is visible up to the right. Jacko on the summit. The GPS showed an elevation of 1324 meter, a bit high, possibly due to the accumulation of snow. Dangerous cornices along the steep side of the mountain.